Claudia Camina – Claudia walks…wherever and whenever she can. Claudia walks…wherever and whenever she can. After depositing Gail, the Doctor Nurse, at the central post office in Pamplona, I sat for a while in Runa Park on the left side of the Arga River. It being a Saturday, people watching was particularly good. 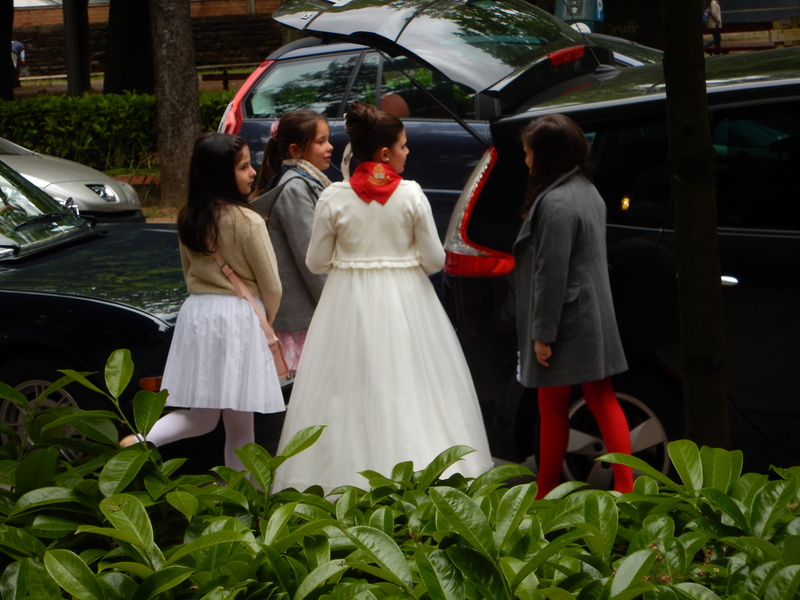 I never did discover why these young ladies are dressed so elegantly in the traditional red and white of Navarre. Mid-afternoon I strolled back to the excellent Casa Ibarrola, intending to curl up in the privacy of my capsule bed and engage in the eminently sensible tradition of the siesta. 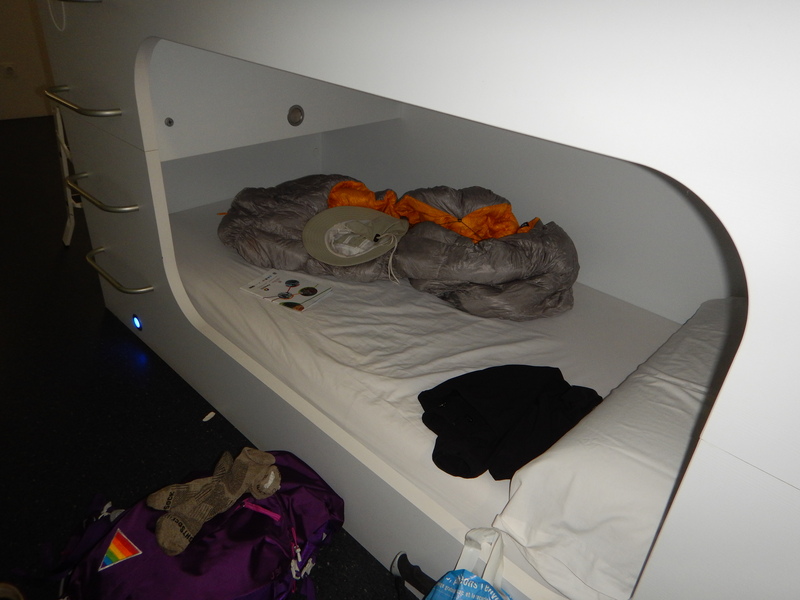 Pull down the shade of your capsule bed in Albergue Casa Ibarolla and you are in a perfect little cocoon. As it happens though, I met Jennifer, a young lady less than half my age, no more than thirty feet from my goal. I could see my bed from where I stood when Jennifer asked if I happen to know the way to the post office. Clearly, I did know the way. The streets of Pamplona, however, are ancient and gnarled. The cobbled and stone-paved streets of Pamplona’s center are often only just wide enough for one car and two pedestrians to pass simultaneously (but pedestrians are the norm and cars the exception). One street appears much like another and one learns to navigate by remembering a shop sign, or a poster in a window, or a particularly nice display of baked goods. I’ve an excellent sense of direction and get about very easily, but even I sometimes had to stop and think which way to go. And goodness knows I never committed to memory the names of all the streets. How on earth was I going to explain that she needed to turn left at the “red” pharmacy, turn left again where a stone in the corner of the building has been nicked, cross the plaza where Hemingway loitered, traverse the arcade at the opposite side, turn left at the shop with local jams in the window, right at the restaurant with the octopus in the window, and so on? 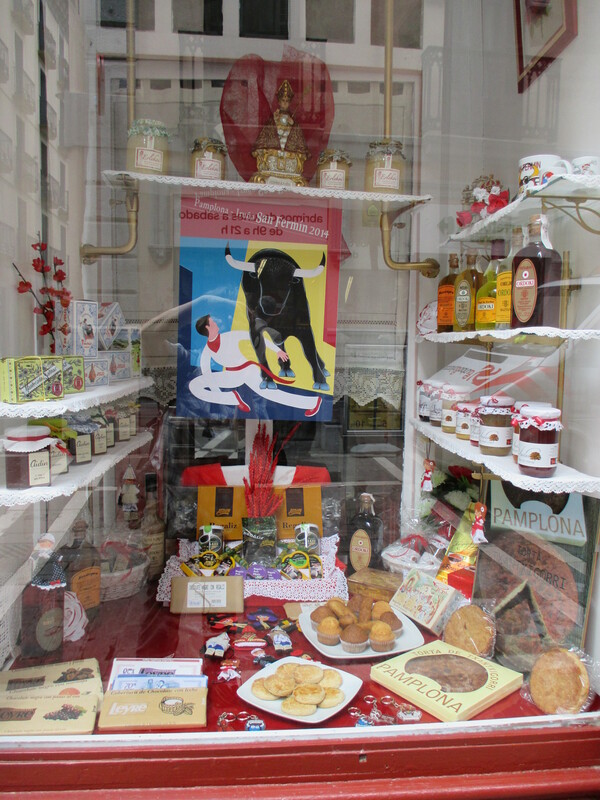 Shop window displaying locally made goods. I paused. I wanted to say, “Nope, no idea how to get to the post office,” but instead I heard myself saying, “I’ll take you there,” and off we went. On the way we passed by the very old and very famous bakery, Beatriz. Gazing upon the scruffy exterior, one would never guess that inside there were the most exquisite, traditional breads, pastries, butter cookies, and empanadas, pastry with savory fillings. I had passed by Beatriz several times already that day and each time there was a line out the door and down the street. In that moment, however, there was no queue at all so I asked Jennifer if she’d mind a quick stop. 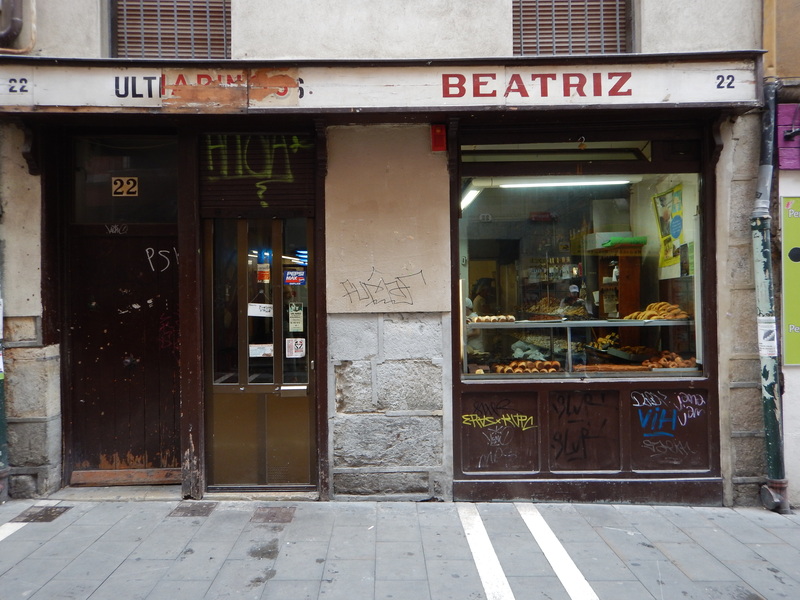 The dubious facade of Beatriz (Beatrice), one of the most famed bakeries in Spain. The smell inside was divine and my eyes were overwhelmed with the selection of delicacies. Mindful that I was on a mission, I selected a roscón, in this case a small ring-shaped pastry made with honey. Jennifer made another selection and then she paid for both. I thought that a nice gesture on her part. Jennifer had no way of knowing that I had hoped for a siesta, but she was mindful that I had abandoned whatever it was I was doing to assist her instead. We chatted as we walked on for another fifteen minutes. We talked about the things pilgrims typically tak about: shoes and feet, steep hills, good restaurants, and albergues where we had slept. I mentioned that I had stayed the previous night in Albergue Parroquial de Zabaldika (Be sure you roll the R’s when you say parroquial!) 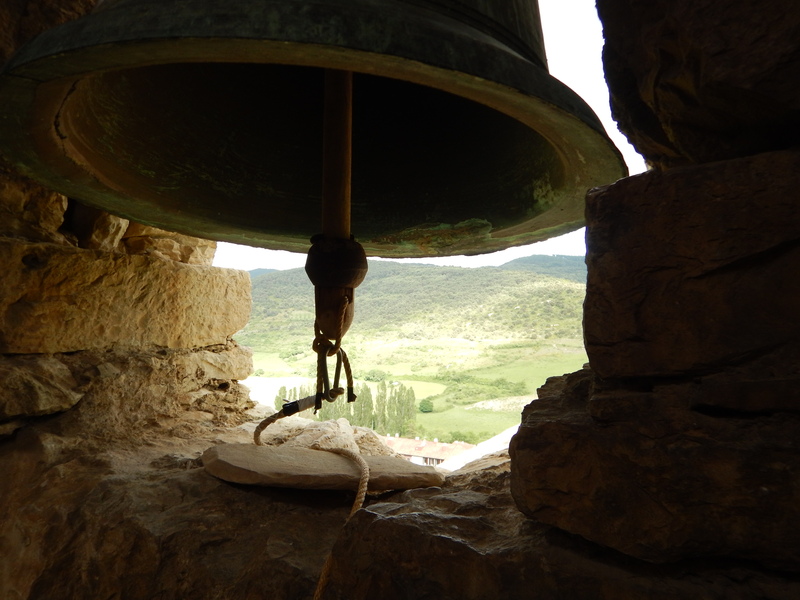 and that I had delighted in ringing the oldest bell in Navarra in the 13th century bell tower alongside the albergue. The ancient bell in the tower of St. Esteban Church in Zabaldika. Then, for no reason in particular, I said, “Unfortunately, I left my towel there this morning. I’ll have to buy another but I doubt I’ll find one as lightweight, with it’s own little pouch and a convenient hook for hanging.” Jennifer stopped and looked at me. “What?” I asked a little perplexed. “I brought two towels just like that and I’m about to mail one of them back home. You can have it,” she said. It’s not too surprising, I guess. Good deeds rarely go unrewarded. I regretted the brief moment earlier when it occurred to me with some reluctance that I had spent a good part of my rest day walking to and from the post office. Now I had a replacement towel, which was a blessing, because, as I had surmised, there’s no way I’d have been able to buy in Pamplona a pack towel that weighs a mere ounce. Thanks, Jennifer! 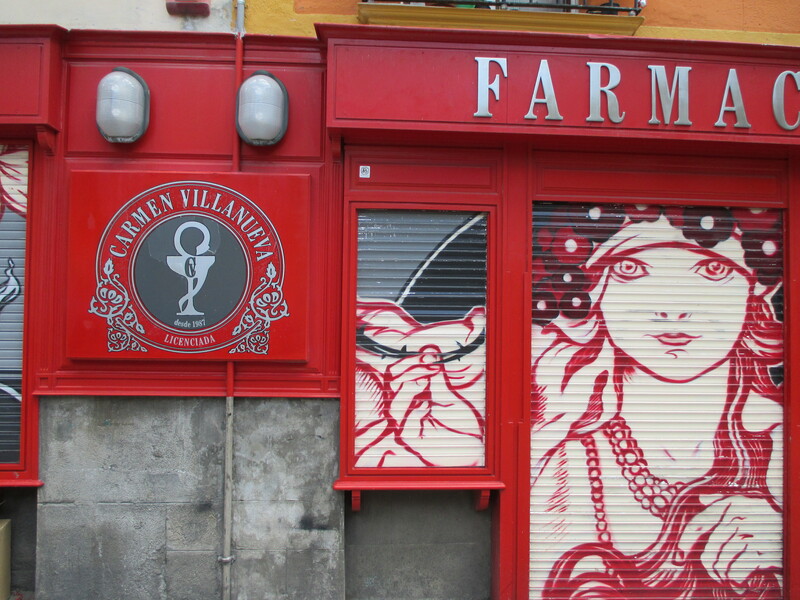 The day I walked into Pamplona, I was delighted with myself, not because I’d done anything challenging or arduous, but because I had walked a relatively short distance, had arrived there at ten in the morning, and had decided to stay and enjoy this small city rather than continuing on as far as my legs would carry me that day. It might not seem like much, but I considered it a victory that I was able to slow down and relax for a while. There is endless pressure to go forward on The Camino. 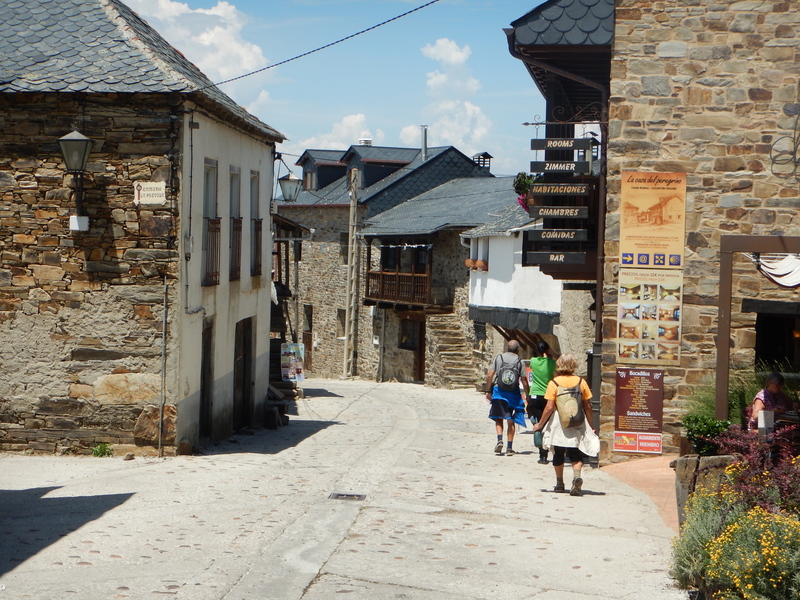 Fear of not finding a bed (mostly unfounded), not wanting to fall behind Camino companions one has come to know and like, the struggle for “personal best,” and simple momentum push one on and on. Even the certain knowledge that I couldn’t keep up fifteen or more miles of daily walking for a month wasn’t enough to make stopping and resting easy. I had to make a conscious effort to rest. After securing a bed in the heart of Pamplona, I traipsed along to the tourist office and then to the post office to mail a birthday card. Then I plopped myself down in a small, quiet bar in Calle de la Zapatería and enjoyed a glass of wine. I’m normally a red wine drinker but it was a sunny midday, I was feeling cheerful, and the bar was gleaming in its white décor. White Navarra was just the thing. Perfect. So there I was, kicking back, taking it all in. Calle de la Zapatería (Street of Cobblers) is not directly on The Camino so no pilgrims passed by as I sat people-watching. That made it the more surprising when a tall, obviously American woman (Americans are easily distinguished by the way they walk!) came in sight. She was struggling to make out directions on the tourist map she held in her hands as she loped along under the weight of a massive, maroon-colored pack. As she passed I asked her if she wanted help with directions. The woman was forty-ish and a bit chunky. She said she wasn’t headed anywhere in particular as she was killing time while waiting for an evening bus that would take her to Logroño. We got to chatting and I learned that her name is Gail, that she is a nurse and that she had, just the day before, defended her dissertation at the University of Wisconsin. Having successfully navigated the defense, she headed straight for the airport and the series of planes that deposited her in Pamplona that very morning. She looked tired. …is not nearly as heavy as some others. “So what have you got in there?” I asked. She began to unpack right there on the white bench in front of the white bar. “Perhaps I don’t need this skirt,” she said. “And do you think I need two hats? Is sixteen ounces of shampoo too much?” And so on. By the time we were done, she had culled at least ten pounds. By my estimation, she still had too much weight in her pack and I imagined that, like so many others, she would contribute to the discard piles in the albergues in her wake. As I escorted Gail to the post office so she could mail her excess items back home, I plotted how I might excuse myself when we arrived and leave her to do the business on her own…I was eager to get back to my well-deserved relaxing. Most every day on The Camino I saw something interesting, something I’d never seen before, something crazy, something ironic, or something that made me burst out loud laughing. Remember the saying, “When in Rome, do as the Romans do.” There’s a reason the refrain doesn’t go, for example, “When in Paris, do as the Parisians do.” In Rome, in Italy actually, things work well but in a manner quite distinct (and often frustrating for foreigners) from other first world countries of the west. One can try to understand it, but understanding isn’t always helpful. For a harmonious life, one has simply to accept and to respond accordingly. It’s best to keep an open mind and suspend judgment. Things, in general, are neither better or worse here or there; they’re merely different. Any one who has driven a car in a city anywhere in the world knows that parking is a challenge. That, at least, is no different in Lugo, Spain. Still I was surprised, and amused, to see one person’s solution to the problem of parking. The car is, after all, off the street and off the sidewalk (mostly) but I don’t think I, myself, would attempt to park in a shop window. This is a delicate subject. Definitely. Basically off-limits. Which is strange given that virtually everyone uses toilet paper, multiple times, every day. Unless your home or office is connected to a septic system rather than a sewer system, you probably never give it a moment’s thought. But if you’re going to go camping or long-distance walking, it’s something you really ought to think about. 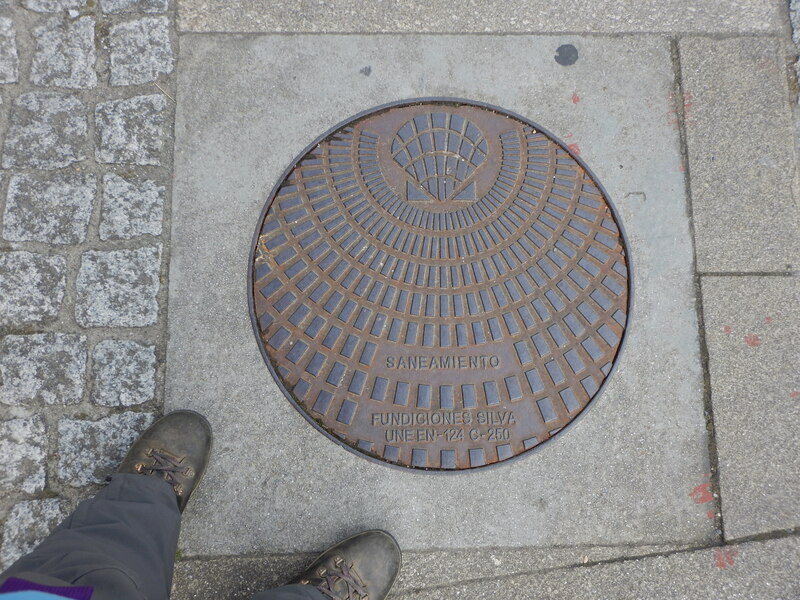 Sewer cover seen on The Camino de Santiago. The scallop shell is the symbol of Santiago (St. Jack), and it is seen everywhere across the north of Spain. On a typical Camino day, there will be at least a few opportunities to relieve the bowels and the bladder. 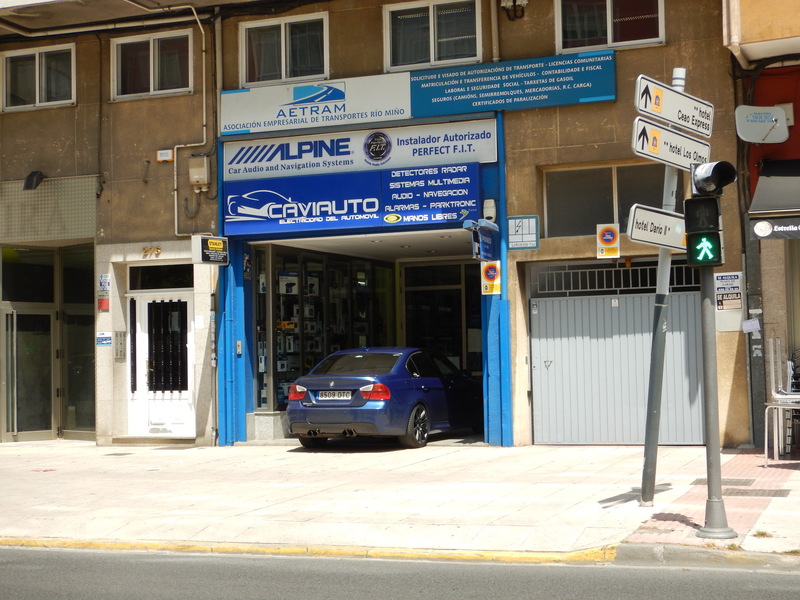 Businesses all along The Camino are well aware of this particular human need and they usually provide facilities. Ask for aseos (pronounced ah-say-o’s with the accent on “say”) or servicios (pronounced sair like hair-bith-ee-o’s with accent on “bith”). Many times you can stop in at a bar and use the bathroom without purchasing anything but be mindful that a constant stream of users amounts to significant expense in water, paper products, and general wear and tear. It’s really only fair to purchase something, if only a bottle of water, if you’re going to use the restroom. Purchasing a bottle of water is, in fact, an excellent practice. Rather than carry a full day’s complement of water, carry a small amount. When you stop to relive yourself, buy another bottle. Drink it before your next rest stop, and start the process all over again. It cuts down on weight in your pack, it ensures that you drink adequate water during the day, and it fairly compensates the business owner who provides you with bathroom facilities. Win-win. Now then, sometimes, perhaps often, a bathroom along The Camino will be without toilet paper. Many times I heard pilgrims complain about the lack of toilet paper in bathrooms. Think about it, there’s a steady stream of users throughout the day. It stands to reason that the toilet paper roll needs to be changed several times each day. Rather than assume the establishment has no intention of providing paper, for goodness sake, tell someone. Each time it happened to me, I brought it to the attention of the barkeeper or the owner or any employee I could find. Every single time I did, the response was, “Oh, thank you. I’ll change the roll right away.” Of course the business wants to keep the bathroom stocked with toilet paper. They know full well that if they don’t, people will put paper towels, newspaper, and all manner of other things down the toilet…resulting in the need for a plumber. Ah, but because you’re already in the bathroom when you realize there is no toilet paper, and perhaps because there is a line of people waiting to use the toilet when you’re finished, you might want to do your business before going to inform someone of the lack of toilet paper. Precisely for that reason, I carry a supply of toilet paper with me. Before leaving home I buy a roll of one-ply toilet paper (more on this later) and make a few dozen little packets of folded paper. Then I put the stack in a ziplock plastic bag and stash the bag in a conveniently reached pocket of my pack. Before entering a restroom, I pop the plastic bag in my pocket. Just in case. Let’s face it, though. Sometimes Mother Nature calls when you’re nowhere near a restroom. If you must relive yourself in the great outdoors, there are some simple rules that will benefit you, everyone else who uses that path, and the general environment. Firstly, to do your business, find a place well off the path. Don’t presume that just because you’re male and you only want to urinate that you can go wherever you like. Urine odors are pervasive and can be quite offensive on a hot day. What’s more, urine contains nitrates in sufficient quantity to kill plants. Think about the grass verges around the entrances to apartment complexes. The grass is always devastated there because when a dog owner gets home for work and takes the dog out, the poor creature relieves itself at the first available spot…right by the entrance. Some more precautions: DO NOT hide behind a hay stack at the side of the trail to do your business. It’s mighty unsanitary and encourages flies, rodents, and other pests. DO go at least one hundred feet (30 meters) away from a water source such as a pond, stream, or river. Human waste is extremely hazardous to open bodies of water and remember that you will be in an environment where many people will be looking to do the same thing. In the aggregate, it can add up to significant environmental degradation. Now we come back to toilet paper. Inside the ziplock bag with the stack of folded toilet paper, I keep another ziplock bag for disposing of used toilet paper. But if you haven’t got a bag just for disposal, Folks, it’s not that difficult to simply fold up the toilet paper after you’ve used it and stick in your pocket. You can throw it away at the next trashcan you come to. It’s indecent to leave your used toilet paper scattered about. Period. Here’s where one-ply toilet paper comes in. If for some reason you absolutely must leave your toilet paper behind, one-ply paper decomposes much, much faster than two-ply. (Go here to see the results of a paper decomposition in the outdoors experiement. http://hikethru.com/hiking-information/backyard-science/toilet-paper-decomposition) If you bury it, one-ply paper will decompose much, much faster than one-ply paper left exposed. Just do it. 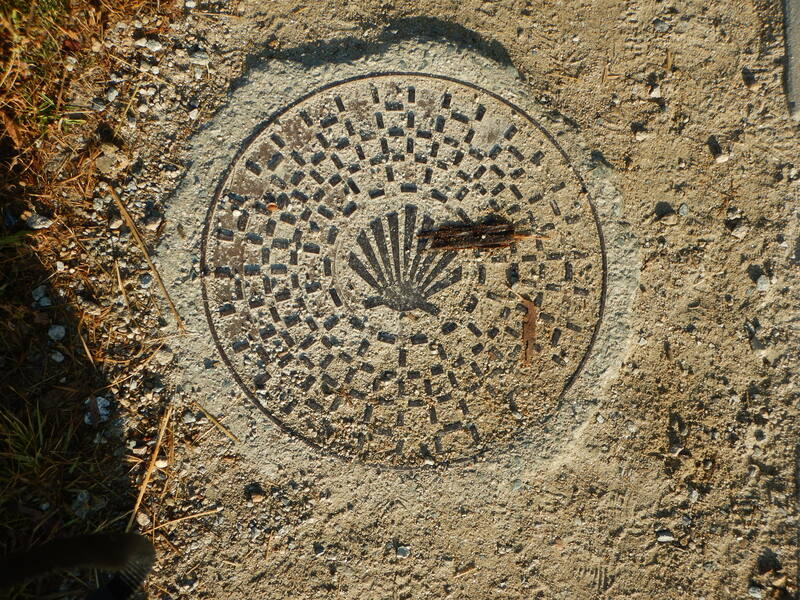 What’s more, many bars and albergues along The Camino are on septic systems, not public sewer systems. One-ply toilet paper is much easier on their facilities. Clearly most people don’t think about what they leave behind them as they’re walking along, but everyone is obliged to consider what others before them have left behind. Doing the right thing makes The Camino a happier and healthier experience for everyone. If you’re a simple soul with few needs, preparing your for toiletries for the long distance walk on The Way of St. James will be no more difficult than finding travel-sized products such as shampoo and deodorant and popping them in a zip top plastic bag. Enough said. If, on the other hand, you’re a creature of comfort, or you are particularly attached to certain personal hygiene products, you’ve got some work to do. I had some frustrating moments dealing with my toiletries during my trial-run Camino adventure in 2014. First and foremost among the issues is weight and size. Obviously, anything heavy or bulky was automatically rejected. Small, travel-size bottles and containers are a must, but it goes beyond that. The first restriction to consider is air travel regulations. Traveling via airplane and not checking luggage means you’re limited to containers of a maximum of 100 mililiters (3 ounces). Here’s a tip: a high-quality shampoo such as Tigi Bed Head, Redken, or Bumble & Bumble, goes a lot further than a typical supermarket purchases such as Suave, Alberto VO5, or Clairol. Although, like everyone else, I showered and washed my hair daily, I was able to make my shampoo last for more than thirty days. It meant being conscientious and using the minimum amount of shampoo that would get my hair clean. To be frank, I was surprised that I could make three ounces of shampoo last for so long. Having realized that I can get by perfectly well using far less shampoo than I have in the past, I continue to use the minimum, even now that size and weight are not an issue. It’s better for the environment and it’s better for my wallet. Same goes for hair conditioner. 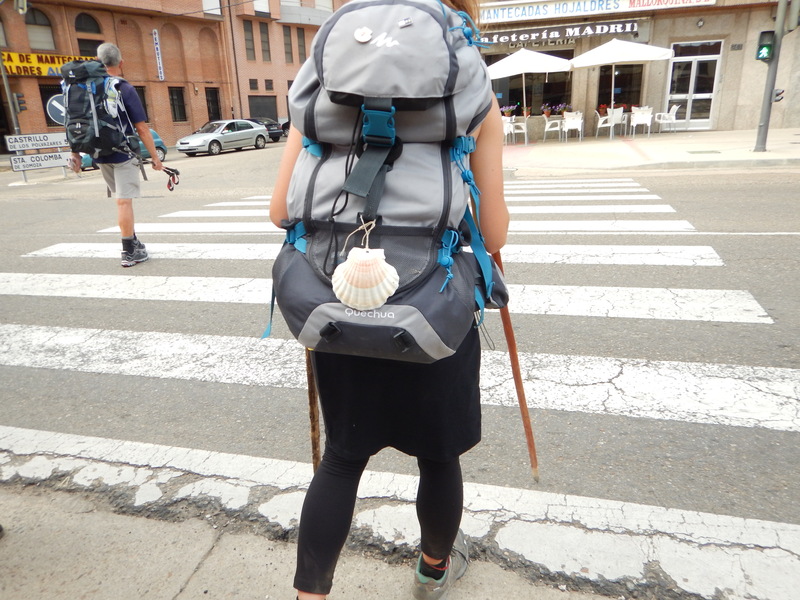 Some women I met on The Camino opted to do without conditioner rather than carry the weight. That wouldn’t work for me because my hair is thick and gets course if I don’t use conditioner. Besides, by using conditioner daily, I was able to get by with a tiny, plastic comb rather than the heavier, bulkier hairbrushes some women carry. After the air travel restriction on size, the next thing to consider is weight. A bar of soap typically lasts longer and weighs less than liquid soap so I cut off a third of a bar of soap and put it in a snack size ziplock bag. It too survived the entire Camino and lasted well beyond. Shampoo, conditioner, and body lotion are liquid products so a ziplock bag won’t do the trick here. I used the REI TSA Friendly Flat Bottle Kit (http://www.rei.com/product/866090/rei-tsa-friendly-flat-bottle-kit). The bottles are collapsible and, when empty, weigh almost nothing. As I used up my products, the bottles collapsed and took up less space in my pack. Standard plastic bottles weigh more than collapsible bottles and take up more space, even when they are almost empty. The flat bottles worked perfectly, never dripping nor leaking. 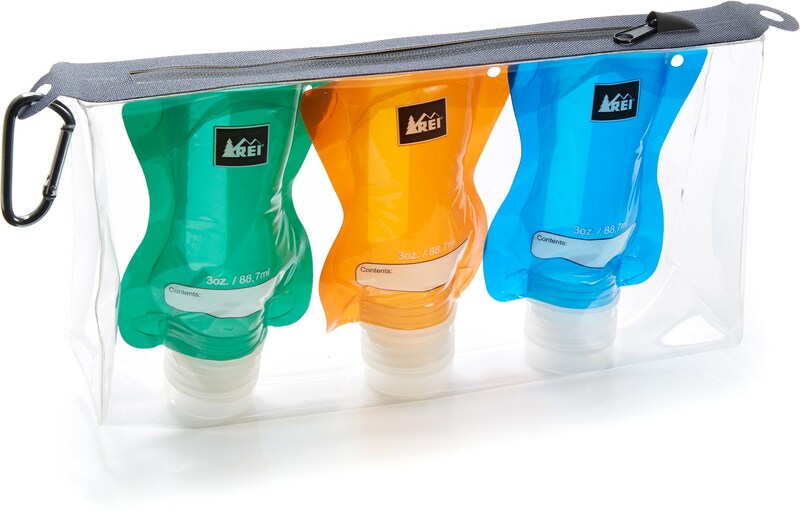 The REI TSA Friendly Flat Bottle Kit has 3 oz. bottles that collapse as they are emptied. When it comes to deodorant, even a travel size container seems larger and heavier than necessary. I bought a gel deodorant and squeezed out enough to fill a tiny travel jar (http://www.storables.com/0-3-oz-pill-container.html). Each day I simply dabbed some deodorant on my finger and spread it on my underarms. I found that, once again, I could do quite nicely with substantially less deodorant than I typically used in the past. The one-third of an ounce jar of deodorant lasted for the entire Camino. Toothpaste wasn’t a problem for me because I simply didn’t use any. My dentist says that toothpaste really adds no benefit except that the flavoring encourages people to brush a little longer than they might otherwise. I love the feel of clean teeth so no toothpaste needed for me. I typically wash my hands several times during the average day. Rather than digging through my pack for soap, I carried Sea to Summit Pocket Hand Wash in the hip belt pocket of my pack. (http://www.rei.com/product/785913/sea-to-summit-pocket-hand-wash or the Coleman version http://www.amazon.com/exec/obidos/ASIN/B003EMAFO2/20140003-20 in the USA or http://www.amazon.co.uk/Sea-Summit-Trek-Travel-Pocket/dp/B00M34EQC4/ref=sr_1_3?ie=UTF8&qid=1439695417&sr=8-3&keywords=sea+to+summit+pocket+hand+wash in the UK.) 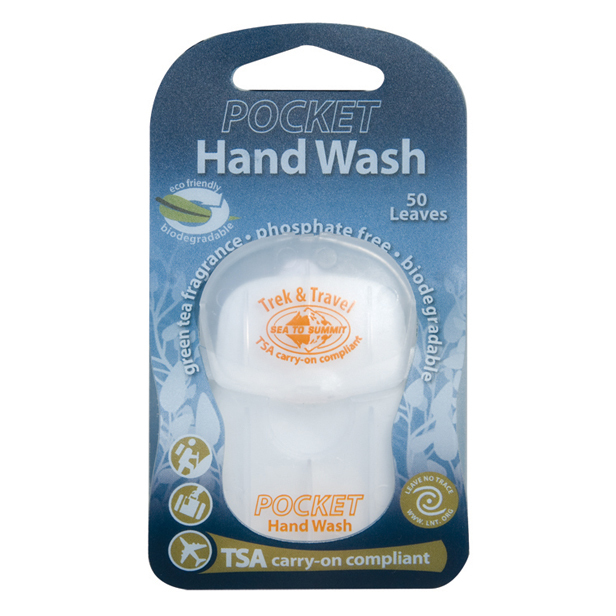 This tiny, lightweight container has 50 leaves of soap and is very convenient. I even found that I could get my hands completely clean by using only half a sheet and that meant I got one hundred hand washes from a single package. Sea to Summit also makes pocket containers of body wash, conditioning shampoo, and shaving soap. I wouldn’t find these products convenient to use in the shower, though, because you can’t remove just one leaf when your hands are wet. Several leaves will stick to wet fingers and it’s impossible to separate them from your hand before they begin to dissolve. Soap leaves are convenient because they remain dry and lightweight until exposed to water. These are my suggestions for toiletries. I shaved an entire pound off the total weight of my pack by following these practices. A pound doesn’t sound like much, but when I’m carrying it on my back, day after day, I notice immediately when my pack weight diminishes by a pound. If you have discovered other products or practices that work particularly well for long-distance walking, I’d love to hear from you. This is where the confusion comes in. A decade or so ago, the Spanish government earmarked money to encourage the creation of countryside accommodations for vacationers and holidaymakers. As is typically the case, the money was doled out to the autonomous regions (La Rioja, Asturias, Castilla-La Mancha, Andalusia, etc.) which then each created their own requirements for further disseminating the money to corporations and/or private individuals who took up the challenge. The end result was a mish-mash of lodging types from single rooms in a private home to entire mansions with heated pool, gourmet kitchen, and groundskeepers. 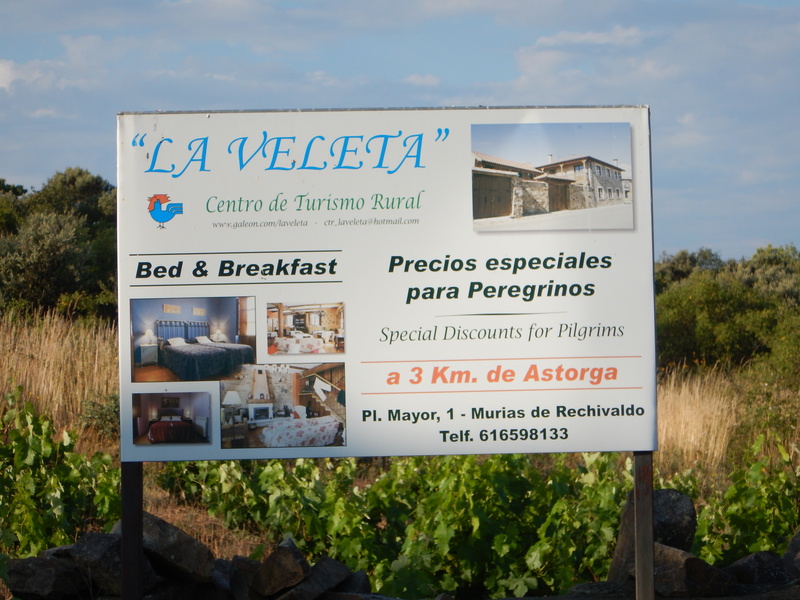 A casa rural that provides English translation on its sign is a good place for non-Spanish speakers to try lodging that is not an albergue. It’s Spain…so even an entire mansion is going to be extremely reasonably priced compared to similar accommodations in other countries, but I’m talking Camino. 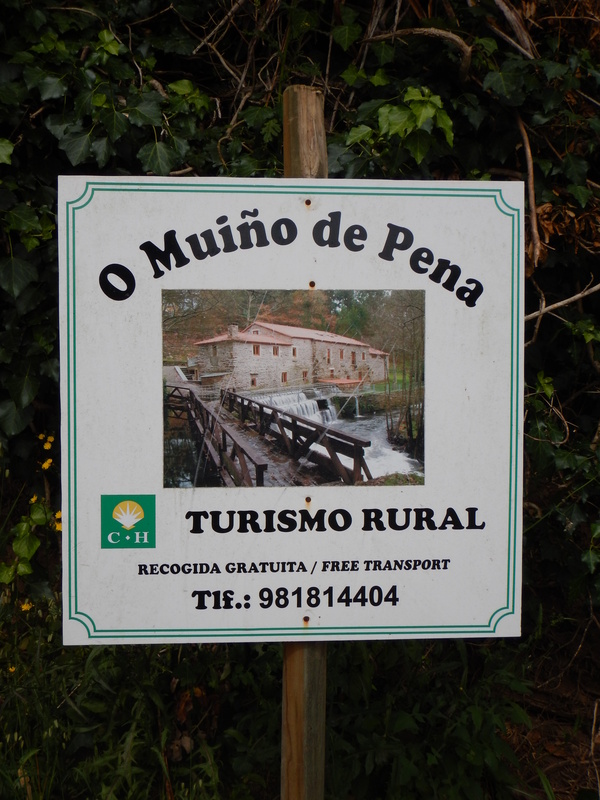 If you’re swinging along a Camino path and you come across a small sign that says Casa Rural, go ahead and assume that the owner is marketing to pilgrims and not to the CEO of IBM. I phoned several of the casa rurales posted along The Camino Francés (The French Way) and I found rooms available for as little as 15€. Granted, on offer was a bed, in a private room, in a private house, and nothing more, but that’s very inexpensive because I sometimes paid 15€ or more for an albergue bed in a dormitory style room. Almost always a casa rural will provide dinner and/or breakfast at a reasonable additional cost. The food is guaranteed to be homemade and, if you’re really lucky, you’ll get to sit down at the table with the family. (If you’re really, really lucky, there will be some vegetables on the side.) What better way to learn about the people of the country you are walking through than to spend time with them in their homes? 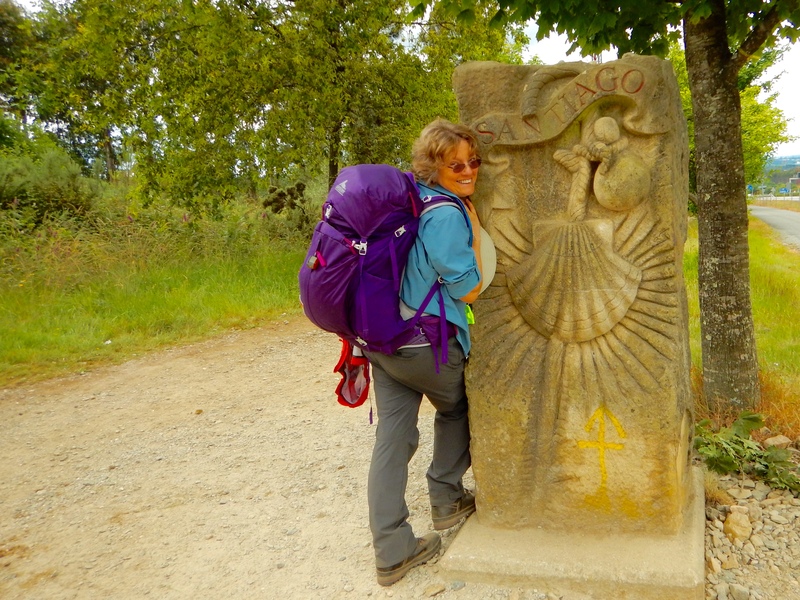 You want to know about The Camino? It’s history? Places of interest? These people will know. You don’t speak Spanish? Well, here’s your opportunity to begin learning. But be assured that most Spaniards under the age of sixty speak at least some English. And they’ve seen every sitcom and television drama you’ve ever seen so you’ll have plenty to talk about. And laugh about. Are you old enough to remember “Falcon Crest” or “Knight Rider” or “Dallas”? (The hairstyles, alone, are bound to be good for some laughs!) Or maybe you’re crazy about “Downton Abbey”? Trust me, the Spaniards are just as crazy about it. It astonishes me how many, many people will spend an entire month in Spain and go home knowing nothing more than tortilla de patata, vino, and albergue. You have options, Pilgrims! Why settle for racing from one squeaky bunk bed to the next? Step outside your comfort zone from time to time. Get to know Spain and Spaniards and you will have so much more to tell others when you get back home. On The Camino you’ll hear a lot of chatter about getting on the road early to make sure you find a bed for the night. In my experience, if you’re a bit flexible and have a bit of money to play with, the options are endless and you’ll never find yourself scrambling for a bed. 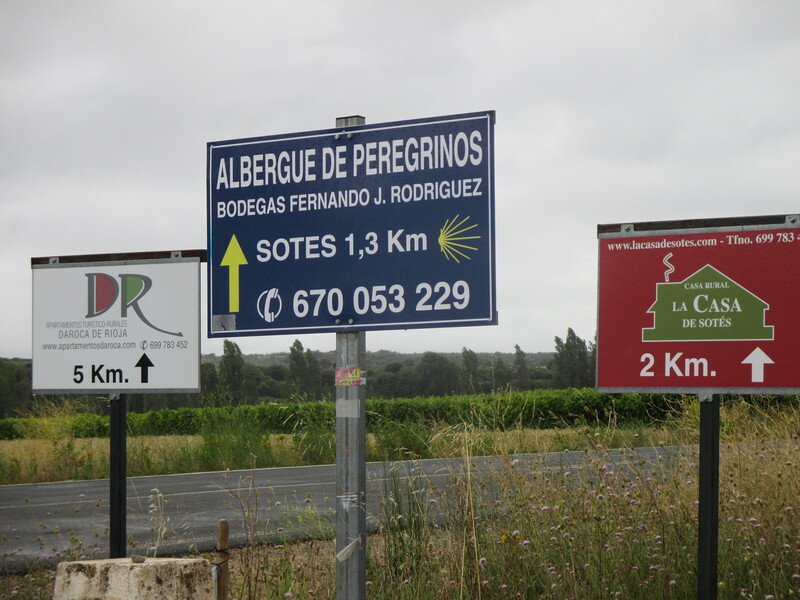 In “Sleeping on The Camino, Parts 1-3” I’ve discussed the ins and outs of albergues. Now we’re ready to move on to other types of lodging. It gets confusing if you are at all anxious about where to sleep because precise definitions of lodging types in Spain is difficult. There are hostel, hostal, refugio (refuge), pensión, posada, casa rural and turismo rural (country cottage or farmhouse), hotel, parador, spa, and most likely a few designations I’ve forgotten to mention. For an explanation of lodging types, go to the official Spanish tourism site (http://www.spain.info/en/reportajes/alojamientos_para_todos_los_gustos.html) or this blog (http://www.travelinginspain.com/hotel.htm) for a more personal perspective. For my purposes, suffice it to say that there are many types of accommodation and often enough little distinction between them and plenty of room for overlap. I don’t have a name for the first type of lodging I want to address because it seems to be a very informal sort of affair. In many towns where earning opportunities are scarce, private citizens have mounted private enterprises to take advantage of the burgeoning number of pilgrims. With a little research, it’s possible to find a double room with a private bath in a quiet apartment, used exclusively for paying guests, for thirty or thirty-five euros. I once was offered a private double room, for me alone, for twenty-five euros because the owner hadn’t managed to rent out even one room that night. Don’t be afraid to negotiate. This kind of lodging differs from a bed and breakfast in that the owner doesn’t live in the same apartment and breakfast isn’t included. The apartment will have a living room and kitchen that is shared among those guests who are staying the night. Because they tend to be new, the ones I saw were clean, comfortable, and had new furnishings. In a small town you can ask at a local bar for private accommodation. The bar owner tends to know pretty much everything that goes on in a small town. Well, pretty much everyone knows pretty much everything that goes on in a small town, but bar owners, in particular, can be helpful. In fact, many bar owners themselves can provide a room for the night. Bar owners are also readily accessible and accustomed to dealing with people who don’t speak Spanish. 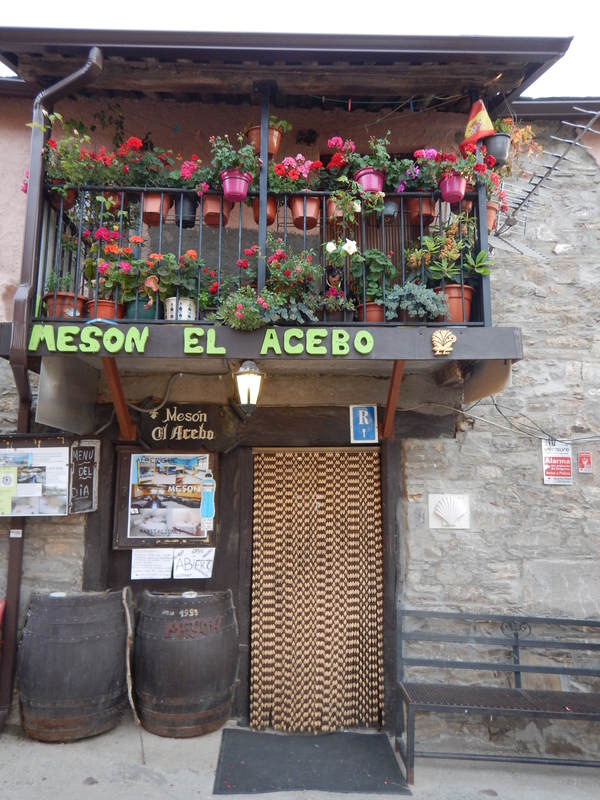 Behind this unassuming façade there is a rather extensive albergue with different kinds of sleeping arrangements. If there isn’t a bar, try a shopkeeper. If there is neither bar nor shop, step out of your comfort zone and ask anyone you come across. Everyone who lives along The Camino is completely accustomed to the passing of strangers all day, every day, and they won’t think you’re too bold or too crazy. The worst that can happen is, failing to understand your words, s/he shrugs and walks away. Pay attention to small signs posted along The Camino. I saw standard printer size postings for albergues, hostals, pensiones, and even hotels. Shortly before arriving to Villafranca del Bierzo, I saw a posting for a special pilgrim rate at the upscale parador in Villafranca. (More on paradors in a future post.) Along roads there will be more formal signage. If I had any question about where I might be spending the night, I snapped a photo of the signs I came across so I could refer to them later if necessary. 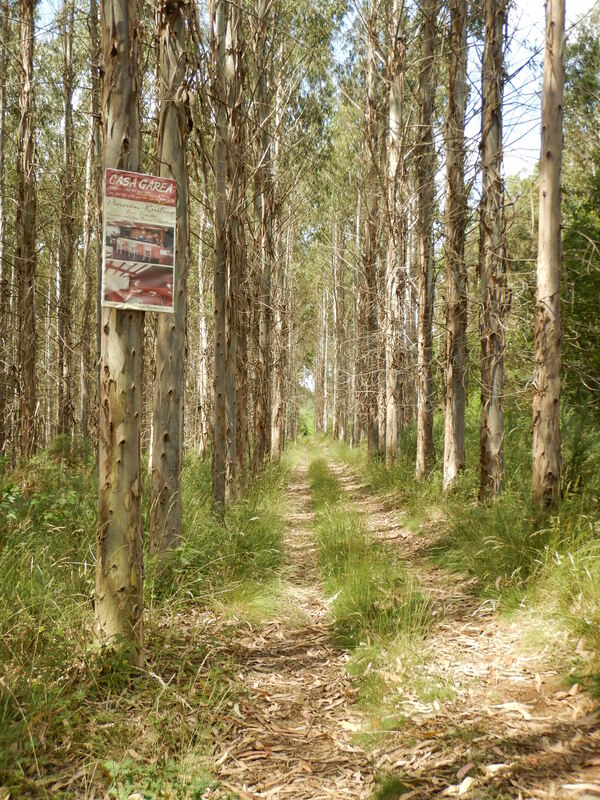 Signs posted along The Camino will alert you to potential lodging. Another means of finding accommodations in advance is to check for a bulletin board in the albergue you’re staying in. Often they post notices or provide business cards for establishments further along The Camino that are run by friends or relatives. If you like the one you’re staying in, chances are you’ll like the ones they’re promoting. If you’re one of the ever-growing number of pilgrims who carry a smartphone and/or a tablet, internet search can be a good way to find lodging, but keep in mind that many albergues, hostels, and pensions don’t have websites.